This week I’ve fortuitously come across three cases of domestic cats leaving their traces in ancient history. I’ll post one daily until Thursday. Many of us have cats who walk across our computer keyboards and turn what we’re typing into gibberish. Well, nothing is new under the sun. This entry was written by whyevolutionistrue and posted on February 19, 2013 at 9:08 am and filed under books, felids. Bookmark the permalink. Follow any comments here with the RSS feed for this post. Both comments and trackbacks are currently closed. 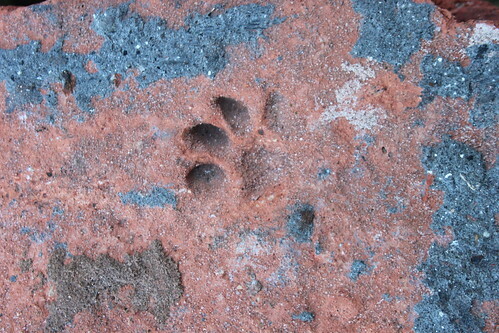 In an archaeological site I found a cat paw printed on the ceramic, on a tegulae! I had to look it up, but it’s a tegula (one of some tegulae – flat roof tiles). The word tegular – overlapping like roof tiles, or I guess fish scales – might come in handy. There used to be a gentlemen’s club here in Wellington with the walls tiled like that. I thought it was squamous. Little did I know it was tegular. 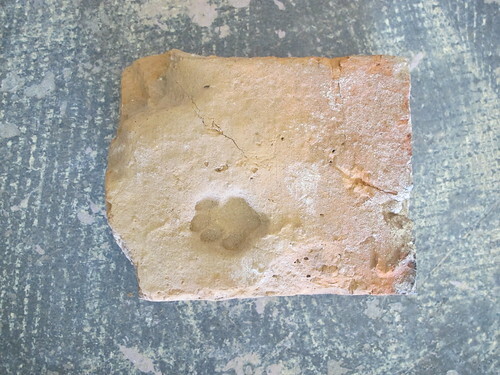 I love old bricks that a cat walked on while wet. I was able to find a few sites around the web with photos of them. This reminded me of an image I saw last month of a cat a 16thC German MS in which the cat was being used in warfare to deliver an explosive device. It looked more like the cat had a rocket attached to its back! – not sure if that’s the dove of peace being used in the same way there too. I don’t need a cat to turn my typing into gibberish. I’ve had years of practice doing that by myself. How have we ruled out that the cats didn’t write or make those bricks? A cat working for a living? What do you think they’ve got (human) staff for? So recreating what happened here, the cat knocked over the ink bottle, walked through the ink with with at least three feet (the paw prints on the blank page look like the same paw twice to me which would also explain the paler look of the second print) and then walked over the manuscript. Actually the prints on the second page are facing a slightly different direction, I think the scribe must have left the room briefly to give the cat the opportunity to put paw prints on the book at its leisure, and then returned to find the disaster. I hope for the cat’s sake it was somewhere else by then. The cement floor of my parents’ garage has a cat paw imprint in it!